For this One King West wedding that took place in January, because the weather was bad, the bride and groom chose to have the first look in the bridal suite on the forty-fifth floor in the presence of the family and bridal party. The groom was going through a roller coaster of emotions and it was apparent that he was nervous. I usually position the groom facing me and I place my second photographer on one side so none of us are in each other images. For the coverage of this first look we did something slightly different at the groom's request. He graciously said that the bride is in fact the main person in the wedding, so she should be placed in the centre of attention. In this image I focused on the groom as he was wiping a tear. A few seconds later he started laughing and advanced to his beautiful bride. I also captured that image and included in the wedding album. As a trick, I always try to increase the pressure on the groom so I can create this kind of photos. If you are getting married at the hotel and it is raining, the bridal suite is perfect for the your first look. To capture this wedding photo, I used a 35mm lens shot at f2.5. Because of the emotional nature of this wedding picture, I converted it into black and white during the post processing phase. From a composition standpoint, this image applies a few techniques that make it stand out. First, it tells several stories in the two layers featured in this image. In the foreground, we see the bride, slightly out of focus, fighting to hold her tears. Meanwhile, in the background, the groom is crying. The bride and the groom form a diagonal in the image, which gives the photograph a nice flow. Also, the bride acts as a framing element for the groom. One King West is one of the top sought after wedding venues in Toronto. There are hundreds of Toronto wedding photographers who shot at this location and I often search for new concepts created at this wedding venue. Sadly, more often than not, I seek cookie-cutter wedding photos that unfortunately don't put the bride and groom or the hotel for that matter in a favourable light. The pun is totally intended. For example, one of the top Toronto wedding photography studios posted a gallery featuring pictures from a wedding at OKW and sadly, all the wedding reception photos were dark. What makes one someone a great wedding photographer who can create masterpieces at this venue? First, you need someone with a great understanding of light. Second, one has to know the best spots that offer perfect backdrops in the hotel. Even more important, that photographer has to know his equipment inside out so that the camera becomes an extension of his body as opposed to a deterrent in creating visual masterpieces. Finally, the ideal wedding photographer has to understand human nature and to have phenomenal people skills. 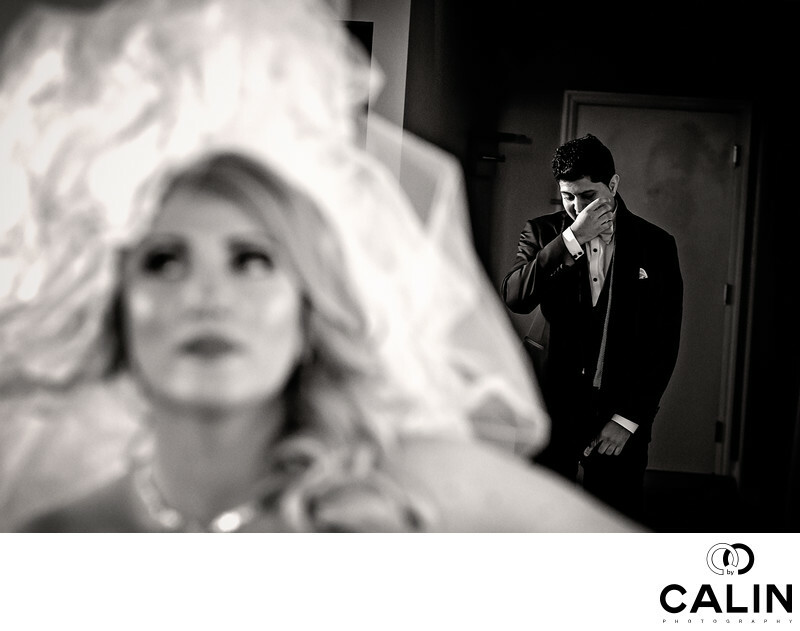 Emotions, are an integral part of a wedding photo. The perfect photographer can capture genuine emotions but also trigger them. While such artist probably doesn't exist, we all strive to achieve that level of professionalism. I can proudly state that I have been named by some of my clients and even wedding industry professionals as one of the best One King West photographers. Location: 1 King St W, Toronto, ON M5H 1A1.